The RP Photonics Buyer's Guide contains 37 suppliers for dichroic mirrors. The software RP Coating is ideally suited for designing dichroic mirrors. In a diode-pumped laser, a dichroic short-pass mirror in the resonator, placed next to the laser crystal, may be used for injecting pump light. In a laser with intracavity frequency doubling, a dichroic end mirror may couple out the harmonic light while fully reflecting the pump wave. In case of external frequency doubling, a dichroic mirror may be used as harmonic separator (see below), i.e., as a kind of wavelength-dependent beam splitter. In laser microscopy (fluorescence microscopy), a dichroic mirror can be used for separating the fluorescence light (containing the image information) from the pump light. Figure 1: Use of a dichroic mirror as a harmonic separator. 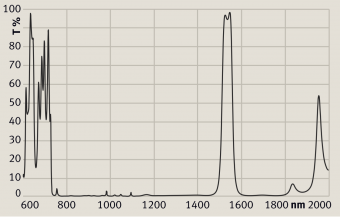 The frequency-doubled light is reflected to nearly 100%, whereas most of the pump light is transmitted, although a few percent of it may still be reflected to the output port. So-called harmonic separators (see Figure 1) are dichroic mirrors for separating the harmonic (frequency-doubled) beam from the pump beam, often outside the laser resonator. For that application, the two wavelengths for which the mirror needs to have very different reflectivities are so far apart from each other that it is easy to make such mirror designs. Most dichroic mirrors are dielectric mirrors, but there are also crystalline mirrors where the multilayer structure consists of semiconductor materials. In electronics, the terms low-pass and high-pass filter are common, where “low” and “high” refers to the frequency. In optics, where it is more common to refer to wavelengths, one uses the terms short-pass and long-pass mirror. Here, a short-pass mirror (or shortpass mirror) is one which has a high transmission at short wavelengths and high reflectivity at longer wavelengths; it could also be called a high-pass filter. 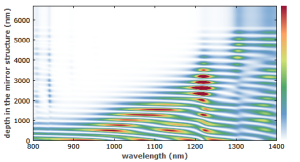 It can be challenging to make mirrors such that the wavelength with high transmission and the wavelength with high reflectivity are close together. Dichroic mirrors are usually fabricated as dielectric mirrors. Depending on the case, the design of the required layer structure may be possible based on analytical considerations, possibly followed by a numerical optimization, or entirely on numerical optimization, e.g. with a Monte-Carlo method. In many cases, the design involves a compromise between the obtained optical properties, the required number of layers, and the required growth precision. 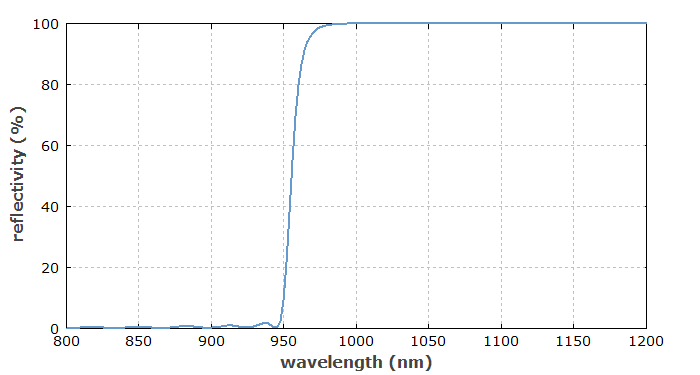 Figure 2: Reflectivity spectrum of a dichroic mirror coating, designed with the software RP Coating for high transmission (low reflectivity) around 800–950 nm and high reflectivity at 1064 nm. For any dielectric mirror, the reflection spectrum depends on the angle of incidence and (for non-normal incidence) also on the polarization of the input light. Only to a limited extent, mirror designs can be made such that the desired dichroic properties are achieved over some range of input angles. As a dichroic mirror has to be transparent for at least one wavelength of interest, the quality (e.g. transmission losses) of the substrate material and possible reflections from the back side need to be considered. An anti-reflection coating on the backside can help to reduce such a reflection, and a slight wedge form of the substrate can often eliminate the effects of residual reflection.